Fall is one of the most important seasons to care for your cool season grass. As temperatures begin cooling down each month, there is a responsibility to properly maintain and prepare your lawn for the dormant winter. When preparing your yard for the change in temperature, there are multiple effective strategies and techniques you should remember. In this article, we will walk through those tips so you can best care for your cool season grass. Fall is one of the best times to aerate your cool season grass. Through aeration, the roots of the grass are provided easier access to oxygen, water, and other nutrients necessary to thrive. Additionally, if your lawn tends to drain poorly, aeration can help distribute excess water. When aerating your lawn, the most effective method is core aeration as it reduces soil compaction and lasts longer than spike aeration. Check out our blog on core aeration to learn more. Having problems with your cool season grass being patchy and lifeless? Overseeding may be the solution to the issue. As the name suggests, overseeding is the process of spreading fresh seeds over an already established lawn. This helps with any areas that have started thinning out as more dormant weather approaches. Similar to dormant seeding, overseeding helps fill any areas in your lawn that are struggling and replaces the grass roots that have died. Get ready for lush, thriving cool season grass. Overseeding is especially important in the fall as this gives enough time for the roots to be established before the brisk winter and the lack of summer weeds minimizes competition. When overseeding, it is also important to remember to mow low to the ground and dethatch any debris and dead grass that might inhibit the seeds from reaching the soil. Pick the Right Fertilizer: Fertilizers can contain different proportions of nitrogen, phosphorous, and potassium. Picking the right fertilizer for the season can be the difference between lush green and dry yellow. For more information on fertilizers, reference our blog here. Don’t Fertilize Before Rain: If it is raining or forecasted to rain, wait to fertilize as the water can wash away and reduce the effectiveness of the fertilizer. 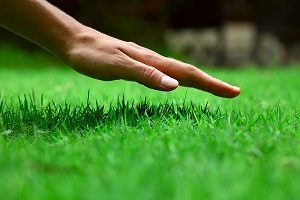 Mow Low Before Fertilizing: Mowing low before you fertilize will help the fertilizer and sun reach the roots of the grass which will promote growth. Through core aeration, overseeding grasses, and properly fertilizing, your cool season grass will have the best chance at becoming the landscape you’ve always dreamed of. If you need help with your lawn or would like more tips and advice, contact the professionals at Greener Horizons today for a free consultation. With over 10 years of landscape management, landscape design, and master planning experience, we promise to provide only the highest quality service.